During the Golden Age of Piracy, pirates were looked upon as the most wicked of the bad. There was rarely such a thing as a "fair trial," for corruption reared its ugly head in most every facet of the legal system. 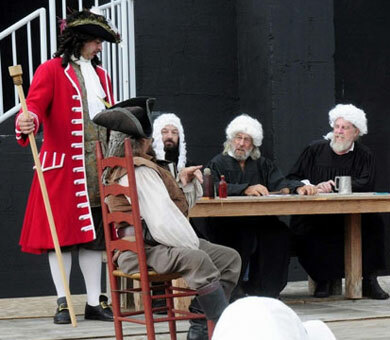 The Act of 1700 gave authorization for Vice Admiralty Courts to be set up in all the British colonies, and pirates were usually tried close to the place where they had been captured. 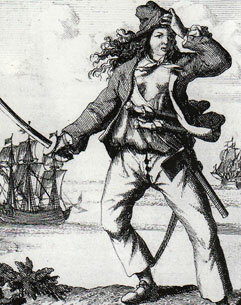 Pirates were usually tried all at once, with several of the crew being brought to the bar at the same time. Usually there was no such thing as legal defense for the pirates, and many pirates were illiterate and not at all equipped to defend themselves in court. Upon being found guilty, the governor would pass sentence upon the pirates in these chilling words "Ye, and each of ye, are to go from hence and back to the place from whence you came . 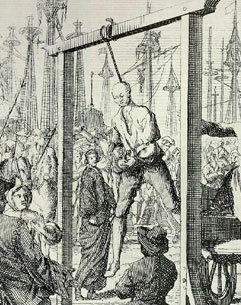 . . from there ye are to be taken to a place of execution, where severally, ye shall be hanged by the neck until you are quite dead! And may God in his infinite mercy have mercy upon your souls . . ."
In the few cases where women were actually brought to trial and accused of piracy, they usually plead their bellies, and their death sentences would be suspended until they gave birth. 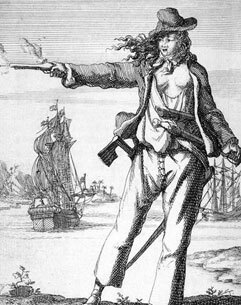 To read more about the trials of women pirates, get "The Pyrate Tryal of Anne Bonny & Mary Read" by Tamara J. Eastman and Constance Bond.